After the caller has sent a signal to the called party’s location from the telephone device to the near-end switch, the subsequent two actions taking place are routing the telephone call and send a signal of the called number to the far-end switch unit. Hint: for more basic concept of POTS telephone systems and how do they work, look for this article, where we discuss POTS basics. The number called needs to be sent afterwards to the far-end switch of the telephone to allow a connection of the forwarded trunk to the appropriate FEL (Far End Loop).
) which closely resembled Dual-Tone-Multi-Frequency types on the trunk line. Hint: We discuss DTMF in more details in this article. The issue emerging here though, was once again the pace, especially taking into account that they are several switches amid the near-end and far-end switches. This would force the entire number to be signaled via tones generated from the initial switch to the next and after this was done, from the 2nd to 3rd, and so on till the far-end. Currently, there is a control program known as “SS7/Signaling System 7” which is also called “CCS7/Common Channel Signaling System” or C7 and is employed to execute the address signaling act. SS7, in particular, is an international standard set by ITU (International Telecommunications Union)/ITU-T Sector. This standard sets the protocols on which network aspects swap data for call initiation, routing, and control (wireline or/and wireless). The ITU description of SS7 enables other variations featuring the Bellcore Standards (adopted in N. America), ANSI (National Standards Institute) and ETSI (European Telecommunications Standards Institute adopted in Europe and the rest of the globe. The signaling process in SS7 protocol is out of band, which means that it utilizes digital coded signals on different information channels without using the tones on the voice signaling channels. 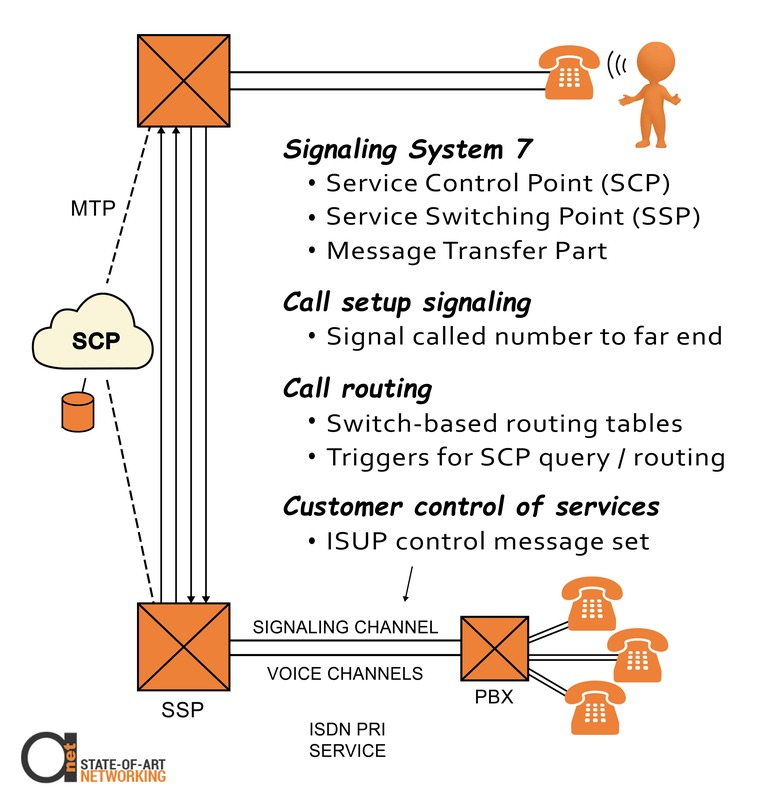 Practically, SS7 consists of integrated databases and computers (known as Service Control Points/SCPs) linked through the MTP (Message Transfer Part) which refers to data circuits and packet transfers known as STPs (Signal Transfer Points). SS7 follows a framework and standard protocols for the transfer of control signals or messaging across switches and computers. The application of call control messages is known as “Integrated Services Digital Network/ISDN” or “ISUP”. An organization’s SS7 protocol will transfer ISUP signals via their switches and via other businesses’ SS7 protocols, as well as via clients’ control programs. Any messages sent to and from client programs are typically transferred via an PRI (Primary Rate Interface) messaging channel. In ideal circumstances, namely the “Advanced Intelligent Network” (AIN), all phone routing plans of action would be taken by integrated computer and SCPs instead of switches. 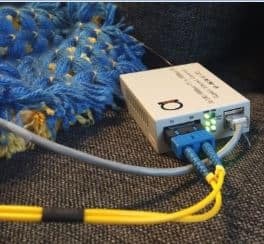 This carries great benefits for the NSP (Network Service Provider) as it enables the pullout of features over one or two sets of the integrated computer devices replacing the need for hundreds of CO switches. The thing is, getting all Service Control points to execute all call routing allows a single stream of failure within the phone network which was evident during a 9-hour total failure of the telephone network on U.S East Coast a few years ago. Because of this pattern of failure, in reality, the majority of telephone service providers employ a call routing system from a provider like Alcatel Lucent to upgrade switch-based routing bases every 10 seconds approx. The switch basically employs this framework to define the call routing instead of an SCP included table. This process enables a more steady activity of the network, in case the call routing computer fails. SS7 system is applied by major telephone service providers for setting-up call messaging to backup database queries and for supporting high-end call routing procedures. Call setup messaging is pinpointing the called number to the far-end switch and potentially the calling number for incoming caller ID aims. The protocol is also employed for call initiation across several carriers like, for instance, passing across the incoming caller number and called number from the local phone device of the system of the business to a wire-free carrier every time a call is initiated from a home device to a mobile phone. A database query message example is credit confirmation for charging phone calls e.g whenever you spare your telephone provider calling card via a payphone or via mobile phone roaming. AIN services (Advanced Intelligent Networks) are also known as high-end value-optimized call routing specifications. Call forwarding specifically is an example of such a home service in practice. Every time you type *72 on your phone device and hear 4 dings, this means that you are now exchanging info with the SCP (sometimes indirectly). When you insert a number you wish to be forwarded to, the database documents an entry and a trigger is entered on your line card. The trigger, in reality, is a bit settled in a status register connected to your line card in the telephone switch device. When a call is about to be forwarded to that telephone number employing the typical switch-base routing system, the feature of the trigger being set on the line card triggers the far-end CO switch to avoid ending a call on that specific line card but execute a query on SCP instead to obtain routing data–which will exist on the number you communicated your phone to. In business applications, examples consist of a typical 800 service and complex call routing procedures that switch when an 800 number is ended depending on the time of day, the geographic spot of the caller or even the volume of the call. An illustration of the above is an airline company operating two separate call centers in different locations across the nation e.g one in California and one in Florida.There will be just one 800- number (1-800-AIRLINE) for that airline company that is available everywhere in S. U.S. Typically, calls are forwarded depending on geographical spot of the caller–for example, callers in the West are sent to the call center in California and callers from the Eastern coast are forward to Florida’s center. Still, the airline company is charged by an Inter-Exchange provider for a service that enables them to balance call loads: if for instance, the call center in California gets bombarded with calls but the Florida one is less busy, the airline can message the network to forward phone calls to Florida, regardless of the geographical spot of the caller and afterwards message the network to switch the call routing back to the standard one, one minute later. This concept is also known as “customer control of a network” or even more specific “real-time customer control of call routing”. This is an intelligent service made available by the SS7 system.